The covers are all super-cool! They include gems like “Train Blues”, a faithful rework of Lux Lewis’ “Honky Tonk Train Blues” which has a glorious saloon piano sound. 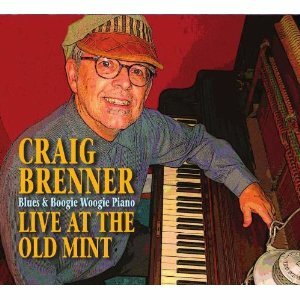 Or Brenner’s version of Pinetop Smith’s 1928 seminal hit “Pinetop’s Boogie Woogie,” his joyous hammering of Professor Longhair’s “Hey Now Baby,” and the familiar sounds of Jimmy Forrest’s “Night Train.” But the standout of these has to be “Mess Around,” a song written by Atlantic Records president and founder Ahmet Ertegün which was one of Ray Charles’ first hits in 1953. The audience really gets into this song and claps along as Craig hoots the vocals and Roberts keep the beat with his congas. This must be something to see live, and of course everyone can commiserate that they don’t want their little girl to mess around.